My guest today is Canadian author Alyxandra Harvey whose debut young adult novel Hearts at Stake debuts one week from today (December 22). I found the novel warm, funny and a thoroughly enjoyable read (my review here). You'll note the two beautiful covers and different titles (US vs UK/Canada) - same book. Alyx answered a few of my questions to let us get to know her and her writing better, but I am sure readers out there have plenty more and Alyx will drop by to answer them as best she can. 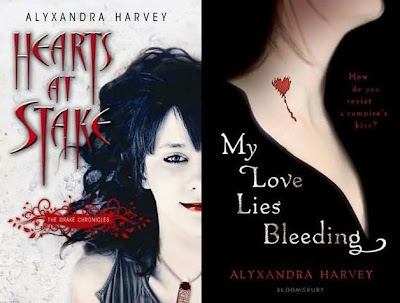 Alyx has also generously offered to giveaway two signed copies of Hearts at Stake to a couple of lucky commenters (details at the end of the post). You can also follow Alyx's 22 Days of Vampires Event on her blog where she also frequently hosts contests. 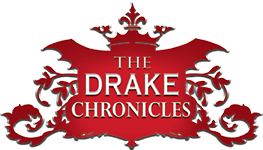 SFG: You have a debut young adult series launching shortly called The Drake Chronicles. Can you tell us a little about the series and the story behind the first book having two titles - Hearts at Stake (US) and My Love Lies Bleeding (UK/Canada)? The series begins with “Hearts at Stake” which is a very loose vampiric interpretation of Snow White with Solange Drake as a girl from an ancient vampire family. On her 16th birthday, like all of her family before her, Solange is going to change into a vampire. Or else die altogether. Book 1 is the story of her struggle to survive, to avoid numerous assassination attempts from those who fear she is going to fulfill an old prophecy and become the new queen, and to navigate an unlikely crush on a vampire hunter. “Hearts at Stake” is the US title (Walker Books) and “My Love Lies Bleeding” is my original title which Bloomsbury UK chose to keep. I love how both covers are so different and yet still represent the story! SFG: Without being spoilerish, do you have a favourite scene in Hearts at Stake? What was the most difficult scene to write? I enjoy writing about Lucy, Solange’s best friend, because she’s kind of insane and has no mute button. This makes for mischief and mayhem which is always fun to write about. Visually, I like scenes in the caves because I could see them so clearly, right down to the tapestries on the wall and the birdcages and mirrors and brocade dresses. SFG: Can you give us a sneak peak at what we can expect in the second book Blood Feud? You have indicated there are three books in the series so far. Do you have plans for more and do you know now how it will ultimately end? “Blood Feud” is the second book in The Drake Chronicles and it’s the story of Isabeau St. Croix. At 17, Isabeau survived the French revolution by hiding her aristocratic lineage and living in the alleys of Paris. Shortly after, she is turned into a vampire and left for dead until a reclusive vampire “witch” digs her out of the ground 200 years later. Now that Isabeau’s visiting the vampire royal courts for a coronation (I won’t say whose), she has the chance to revenge herself on the vampire who turned and abandoned her so many years ago. Or: she can let herself love Logan Drake. Book 3 is the story of Quinn Drake and Hunter Wild who is a vampire hunter in training. I have book 4 (Connor Drake) and 5 (everyone) planned out, and I hope readers will want to know more about the Drake family and their world. SFG: You have also mentioned that you have a couple of standalone young adult novels planned – a Victorian paranormal and one on Faerie. Can you tell us more about these and any other new projects on the horizon? “Haunting Violet” is a Victorian YA about a girl who is discovering shocking family secrets…and an ability to see ghosts. “Stolen” (working title) is about a girl who is taken into Faerie where she must not only save herself, but her flighty aunt as well. I have several other completed novels (historical fiction as well a werewolf story) and I’m currently considering a steampunk novel. And I’m nearly finished a YA paranormal—no vampires, instead it’s full of zombies. And they definitely took me by surprise! And I’m always writing poetry. But not the scary rhyming kind. SFG: What attracted you to write for the young adult market? 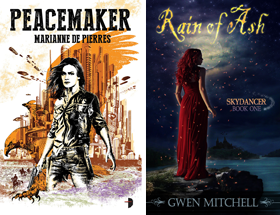 What do you think of the growing popularity of YA supernatural and urban fantasy fiction? Fad or here to stay? I sincerely hope it’s here to stay because I have a lot of stories to tell. I do think it’s uniquely fitted to telling rites of passage and coming-of-age stories. And I truly believe stories can be a friend, especially when you’re trying to figure out who you are. SFG: Does being a Canadian author present any special challenges to getting published? To be honest, my biggest challenge is letting “our” words be spelled “or”! I can’t help but look at words like “honor” and “parlor” and want to bring out the red pen to make them “honour” and “parlour”. Same with “centre” versus “center”. These are good problems to have. SFG: What is your typical writing day like? Where do you write? I am very lucky to have a writing studio where I do the majority of my writing. I try to write every day, minimum 1 page, 5 pages is best, 3 is average. Sometimes I’ll write in cafes but laptops are never as comfortable as I’d like them to be. It doesn’t help that I’m a bit of a techie luddite. I tend to write in the afternoon. I generally write on the computer though “Stolen” was written entirely in notebooks during the month of December (2007). I love handwriting but I detest transcribing. Poetry has to be handwritten. SFG: Any advice for aspiring young adult writers? Beyond the usual “Read, read , read” and “Write, write, write”, I’d suggest making a real effort to finish a project, even if it’s just a short poem or a 2 page story--- because it’s too easy to start a hundred different pieces and never finish them. Also, don’t give up! Or at least, don’t give up for very long. And: notebooks are your friend. I have an embarrassingly large TBR pile that teeters ominously when I walk by. This fills me with glee. I read urban fantasy, fantasy, poetry, romance, YA and lots and lots of history books. I do love a good research book. Some favourites include anything by Charles de Lint, “The Wood Wife” by Terri Windling, ‘Solstice Wood’ by Patricia McKillip and “Ysabel” by Guy Gavriel Kay. And I’ve just finished reading “Soulless” by Gail Carriger which I thoroughly, thoroughly enjoyed. Something that lives for an obscenely long time because I would love to see history unfold. But not a vampire because I don’t think I’d like to drink blood. I’m a vegetarian after all. So, maybe an Immortal? Not sure I’d like chopping off heads very much either though. You see the dilemma? So maybe a time traveler! I could go back to Ancient Egypt, the Celtic Age, the Middle Ages, the Regency period, Victorian Britain… and then come home to my lovely bathroom. I am addicted to hummus. I know almost every word of every episode of “Robin of Sherwood” (BBC series from the 80’s). I *heart* Robin Hood. A lot. See above. Also, Mr. Darcy. But really, that’s not a secret. I am distressingly vocal about the love. Thanks Alyx! You can find out more about Alyxandra Harvey at the Official Alyxandra Harvey Website, the Alyxandra Harvey Blog or The Drake Chronicles Website. There are two signed copies of Hearts at Stake to giveaway to our dedicated commenters. Leave a question or comment for Alyx. Giveaway open until Midnight, December 22, 2009 EST. Do you have a preference as to which title you like more? Was there a specific reason why the publishers in the US thought your original title needed to be changed? I'm really looking forward to this book. Lucy sounds hilarious and I can already tell I'm gonna like her. Thank you for having Alyxandra here and thank you to Alyxandra for sharing. I enjoyed learning about her and her writing. I didn't know her debut novel had two different titles. She's following in great footsteps! (Sorcerer's Stone/Philosopher's Stone). I love that there will be more books in the series and that there are more stand alone novels coming. Thank you for the advice also. I was wondering what Alyxandra reads when she is writing? Does she read outside the genre she is writing or does she avoid reading altogether? PS - I Tweeted about this. PPS - Alyxandra is on Twitter! Both titles and covers look great. I prefer the title “My Love Lies Bleeding”. Curious to see the answer to Sara M's question. Is a time travel book in your future? I tweeted about this post and giveaway. This book, in both titles, has been teasing at me since I first read about it. I admit I like the UK title better, I've never been a fan of puns in titles XD, but I look forward to this book! Also, Alyxandra, I have never seen the named spelled like that! I spell mine the traditional way, Alexandra, and I've seen Alixandra, but hm its so fun to find new spellings! This sounds like a great new series. I love how YA is growing by leaps and bounds. Did you always want to write? Do you see inspiration everywhere? How is a typical day of writing for you? I love finding an author who writes a lot of books whether it is a series or stand alone stuff. Wonderful interview. I always enjoy reading about authors and their individual practices. My question is with all of the fantastic ideas and subjects you've mentioned, are they all for the YA market or would you also consider writing for the adult market too? "I have an embarrassingly large TBR pile that teeters ominously when I walk by. This fills me with glee." You mentioned you would like to see history unfold, would you rather go to the past or the future? SaraM: I have a soft spot in my heart for "My Love Lies Bleeding" for purely selfish reasons: it was my title. ;) and i'm a sucker for poetry. StuffSmart: There's no time travel book currently contacted but I have 2 and half time travel novels completed so I'm ready if the demand strikes! i find them incredibly fun to write. if enough people ask for them, it might happen! ps. StuffSmart, thanks for the tweet! Do you see inspiration everywhere? Yes, most often through mythology, history, art galleries, museums, long walks outside in the woods... and reading author and artist biographies. How is a typical day of writing for you? I tend to write in the afternoon for a few hours, with coffee or tea. On dark cold days I light lots of candles and incense. i like atmosphere! Laurie T: I write adult novels as well though none are contracted. I have a completed paranormal historical romance, urban fantasy vampire and I'm working on a more trad. fantasy as well. Alexandra: I admit my mom doesn't spell my name with a "Y". Lol. But she's used to it now. I changed it when I was 16 and it just stuck. How do you come up with your fabulous titles? The book looks and sounds fun! Love both covers! Great interview, the book sounds amazing and can't wait to read it. I love vampire books and this one sounds really good. I do like the title "My Love Lies Bleeding," and the cover better. I will give your book a try. Just have remind myself to buy it when I head to B&N next time. Another Robin Hood devotee... wonderful!!! I've added you to my OPEN BAR post for today. Ellie- deinfitely the past! that being said i have a glimmer of an idea for a near future story. but generally i go for the candles and the castles and the cravats! Jeanette8042: I steal shamelessly from poems for my titles! without that i am hopeless at anything but one word titles. oh, I love Robin Hood too! I haven't seen the show from the 80's but I have watched the newer BBC show...to bad it's been canceled. I must say I have a thing for the UK/Canadian title and cover, although I also like the US cover (I'm less fond of the title, but that may be cos I'm Canadian *g*). Good luck with your ook, I'll be on the lookout for it, it sounds really interesting! Great interview. I've heard amazing things about this book. Hi, Alyxandra, I have a very silly question–but one that's driving me a little bit crazy, ever since I saw your cover last week. For the US cover, is there any chance the model is Kahlen from America's Next Top Model? She looks an awful lot like her, to me, and it would make me happy to know that Kahlen is working (I love ANTM and always want to know what the girls are up to post-show). And I hear you on the missing U in words...I'm not even Canadian/British and I find myself doing it all the time! I'm sorry, I don't know who the cover model is, but as far as I know it's from a photographer in Croatia (i think) by the name marinshe. Beautiful work! I really like the UK title. Its kinda different and just really pretty. Your book is on my "wish list," Alyxandra! It sounds great! I'm also a big Robin Hood lover. Have you seen the previews for the upcoming "Robin Hood" movie with Russell Crowe? I definitely have to see it! I loved the '80s series with Michael Praed too. The only Robin Hood series I have watched is the recent BBC version and that was pretty good. The books sound great and I hope you will be doing some events for your book release. Hi Alyxandra! I love the idea of a time traveling novel, I hope there will be a demand soon--or maybe just a short story can be shared on your website? I don't think I've seen anything close besides Karen Chance's Cassandra Palmer series, but even then it's hard to really place it there. Best luck with your debut and for the two you're working on! Wow, this series sounds terrific! I must admit, I'm a big fan of retold fairy tales, the more twisted, the better! 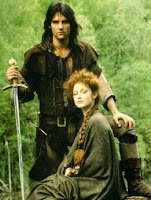 And I used to love Robin of Sherwood, though I haven't watched it in years! Do you have a writing group or critique partner when you write? I'm in the process of joining one of the former, and I'm interested in reading other people's experiences with them. This is the first time I have seen any of Alyx's work. The books look really interesting. Can't wait to give them a try. Question: what's one song that you feel fits your book or the series? Well, I'm glad I'm not the only one with an embarrassing TBR pile. Mine is actually almost a whole bookshelf. LOL!! Thanks for stopping by and for the great contest. Do you have a writing group or critique partner when you write? I'm not currently in any writing group but my beta reader has been my beta reader since we were fourteen years old! i took writing in university with mixed results, it wasn't conducive to genre lit. at all. i've never been in a writing group but i've had writing dates and they can be loads of fun. critique groups, ditto, but univeristy writing classes are basically critique groups-- you just have to learn to deferentiate opinions that are right for the story as opposed to just making the critiquer 'feel' right. best of luck finding a group that feels like home! "Hearts at Stake"/"My Love lies Bleeding" is deifintely echo and the bunnymen "the killing moon". i've posted the lyrics on my blog if you;re curious! Ooh! Love that fairy tale twist. Do you plan on doing anymore twists on any other fairy tales in the future? I am looking forward to reading Hearts at Stake. It sounds great! Thanks for guestblogging. What made you want to write about vampires? I have 2 completed fairy tale retellings...here's hoping they find a home! I like paranormal books and I love the history that a vampire character can have, also that element of danger and all the suave yumminess. The US division and the UK division are run seperately with different marketing needs. I do love how different they are and still reflect the inside! Great interview. Thanks Alyx for sharing. I like both titles and love both covers. Dont know if I would be able to pick between them. But overall it sounds like its going to be a great book. Congrats on the release. Okay, Question is, how many tries did it take before you had an agent say yes? This novel sounds good. My question is if Alyxandra is your actual name, did you have a hard time trying to spell it in kindergarten? My name is close to that and I remember taking longer than my peers. Ever since I was at least 9 years old! Many, many, many tries. I could wallpaper my writing studio with the rejection letters but I started sending out queries before the internet was part of the equation. My question is if Alyxandra is your actual name, did you have a hard time trying to spell it in kindergarten? The biggest problem is filling out forms with tiny short space for names! I want to send out a big thank you to Doug for the interview and review! I'm a born american, but having read books since the 1960's (I was a prolific reader as a child) from the 60's and before, I usually try to spell words like colour, behaviour, humour, etc. It takes a real effort for me not to spell these words with the u in them. How can you stand hummus? (ugh - *g*) just kidding (or am I?) you can like whatever strange food you want to! Have you considered writing in other genres? I just love the cover art. Did you have input on that? Was there ever a day you just wanted to stop writting " Hearts At Stake"? This series sounds great for a YA urban fantasy nut like me! Can't wait to read it. I'm so jealous she has a writing studio! Count me in for the contest. That's really interesting about the 2 titles - Alyxranda is there one you prefer over the other? Glad to hear she plans to keep writing YA. I'm happy for another great series! ooohhh Alyxsandra's going to have a victorian paranormal. I'll wait for that. Scifi Guy - Great review and interview on her book :) now I want to read it. Here's for the hope of winning. P.S: I Tweeted about it. Count me in. Great interview. She sounds fun and I like her pink hair! And I like the UK cover better. More dark and mysterious. Wonderful interview, thanks for sharing. Your book looks like it will be a lot of fun. You mentioned your abiding love for Robin Hood and I was wondering if you've seen the new BBC series "Robin Hood" with Richard Armitage as a really good bad guy in black leather? (yum) I'm in the second season now and really enjoying it. Count me in. It sounds like a great book. I work in a book store and like to be able to recommend new books to our customers. Hey Alyxandra, I love Robin Hood too but I never watched the 80's series but I am watching the new series on BBC. Your book sounds amazing, can't wait to read it. Just made it this book sounds great, and a very good interview. If you could meet your characters, would you give them spoilers? I've been interested in reading Hearts at Stake for awhile then I read Doug's review on it and decided I really did want to read this book. Plus add Alyxandra's description "The series begins with “Hearts at Stake” which is a very loose vampiric interpretation of Snow White...", just topped out my curiosity meter.